Most lists only go to ten, but this one goes to eleven! There’s just that little bit more, you see, right at the end. It’s just that much more productive. When you’re more relaxed, you sleep better, and when you sleep better, you’re more productive. Being outdoors helps you clear your mind, focus on the present moment, and not stress over something an hour or two in the future. And being outdoors during the workday gives you an edge, according to Active.com’s article about how exercise boosts your brainpower. Certain sights, sounds and scents outdoors can remind you of childhood memories. For instance, redwood trees remind my boyfriend of where he grew up in the far north of California; the trees have a relaxing effect and make him feel at ease. Certain vistas, even particular configurations of fallen trees also bring back memories. And of course scents are closely linked to memory. That “walk down memory lane” can bring you a more productive day–that is, if your childhood memories are happy ones. Can anything new be said about being outdoors and being relaxed? One study suggest that even looking at greenery can make people more productive. A study by Frances Kuo, at the University of Illinois, focused on women in Chicago. Kuo and her colleagues compared women randomly assigned to various apartments. Some had a view of nothing but concrete sprawl, the blacktop of parking lots and basketball courts. Others looked out on grassy courtyards filled with trees and flowerbeds. Kuo then measured the two groups on a variety of tasks, from basic tests of attention to surveys that looked at how the women were handling major life challenges. She found that living in an apartment with a view of greenery led to significant improvements in every category. When you’re outdoors, you can think about something entirely different than work and getting that next item on your “to-do” list checked off. You can clear your mind to focus entirely on where you are, or that next step on the beach. Even a walk in a city park, where there is greenery, is superior to walking on city streets. Here’s a good article from Lifehacker about surrounding yourself with nature to be more productive. Ewoks are sentient, diminutive, furry bipeds native to the forest moon of Endor, as described in the Star Wars’ Wookieepedia. When you’re out and about traveling in the woods, you can feel their presence. They’re especially prevalent in the woods, near where I live. People who exercised during their workday were 23 % more productive on those days! Hiking up and down steep hills and cutting across rocky outcroppings will make your heart pump hard. When you’re indoors all day long, you may not realize how shallow your breathing becomes; being outdoors in nature helps to cure that restricted breathing. Although a certain amount of stress can be helpful (for instance if you’re being chased by a bear), stress usually makes people less productive. Being outdoors is widely known to reduce stress. The sounds in the forest or at the beach are much different and more subtle. Practice a different kind of listening when you’re outdoors (not that you can’t use Twitter as a listening tool). And if you didn’t read my article from last week about listening, you might want to. No one can be productive at the same rate every day, and everyone needs some recovery time. 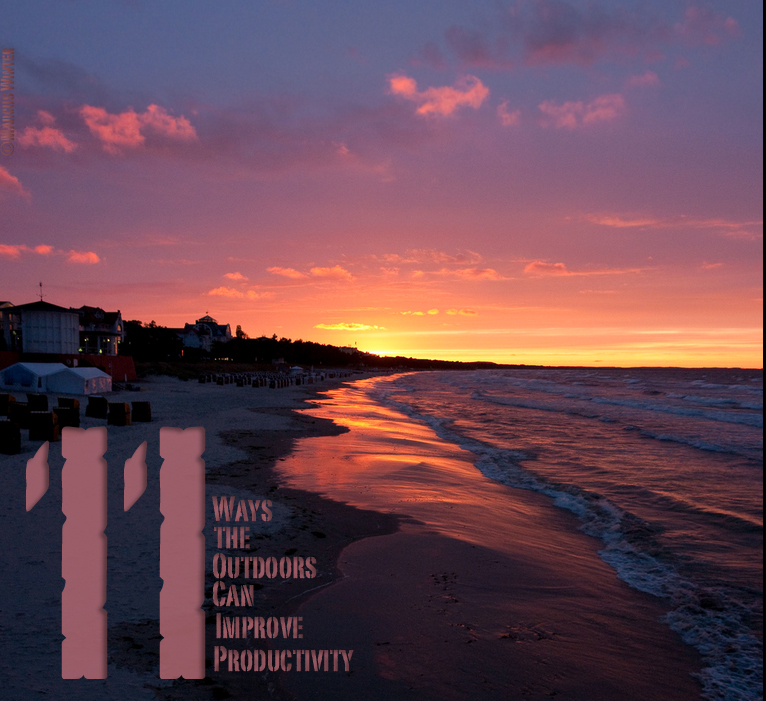 So taking an hour or two to be outdoors brings you back to your work, as outlined in Daniel McGinn’s article about Being More Productive from Harvard Business Review. According to this article “Is a Nature Deficit Hurting Your Productivity?” being in nature exposes you to soothing stimuli that engages your involuntary attention, giving your directed-attention a rest and a chance to become rejuvenated.” And if you’ve read this far, then maybe I’ve convinced you to go to the park. It’s a start.